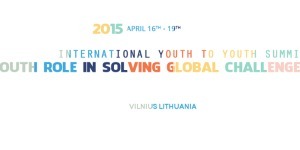 If you are an active youth and interested in connecting with 60 passionate young people from across the world and 20 Lithuanian delegates, you are invited to apply to attend the first International Youth to Youth (Y2Y) Summit taking place in Vilnius, Lithuania from 16-19 April, 2015. The aim of the Summit is to bring together the brightest students, youth activists, leaders in the society, entrepreneurs, professors, diplomats and businessmen to start a dialogue on global challenges of today and tomorrow and to take concrete actions on the ways to solve them. The theme of the summit is ‘’The Role of Youth in Solving Global Challenges and Bridging Gaps Among Nations’’. The event will feature highly experienced speakers across the youth- related fields that will provide an extra bridge to the discussion and will contribute to the outcomes of the event. 100 Euros for international participants residing outside Lithuania. 100 Euros for Lithuanian participants (accommodation covered). 30 Euros for Lithuanian participants (accommodation not covered). The fee covers accommodation, food, materials for sessions. The participation cost has been set with a view that it is considerably affordable for participants coming from all backgrounds. However, international participants are expected to cover their return traveling expenses and visa cost.